Enontekiö's spectacular scenery, hiking trails and the fish-rich waters are the things of which you've probably heard people talking about. Also the Finland's highest fell, Halti is located in Enontekiö. The landscapes differ significantly from the rest of Lapland. The mountaineous scenery and its sparse vegetation makes the northern Enontekiö a special and memorable place to visit. The northern part of Enontekiö is the only place in Finland that belongs to the Scandinavian mountain range. All the more than 1,000 meters above sea level rising fells are located in Enontekiö. In Enontekiö each season is special: in the summer sun can be enjoyed almost two months day and night, while in the winter during the polar night time the sun does not rise at all (30.11.-12.1.). In the autumn you can enjoy the wonderful autumn colors and in springtime Enontekiö offers the best skiing conditions in Finland with lots of snow and sun. LikeFinland -team visited Enontekiö in July, and experienced the popular Hetta-Pallas hiking trail. If Enontekiö would be described only by a few words, I think it would be a hiker's paradise because of its wide range of hiking trails for hikers in all levels. Enontekiö offers perfect conditions also for fishing, canoeing and mountain biking. ... the highest point of Finnish highways? From the south towards Kilpisjärvi, while driving, you will meet the highest point of Finnish highways, Muotkatakka (565.8 m). Muotkatakka is located approx. 12 km to the south from Kilpisjärvi. ... Finnish Niagara waterfalls, Pihtsusköngäs? However, the waterfall has not been made easy to see. The distance of 17 m high waterfall is approx. 45 km on foot. ... a place where you can walk at the same time in Finland, Sweden and Norway? A day trip to the Three Nations’ Border Point is worth to visit. It is located in Malla Strict Nature Reserve. 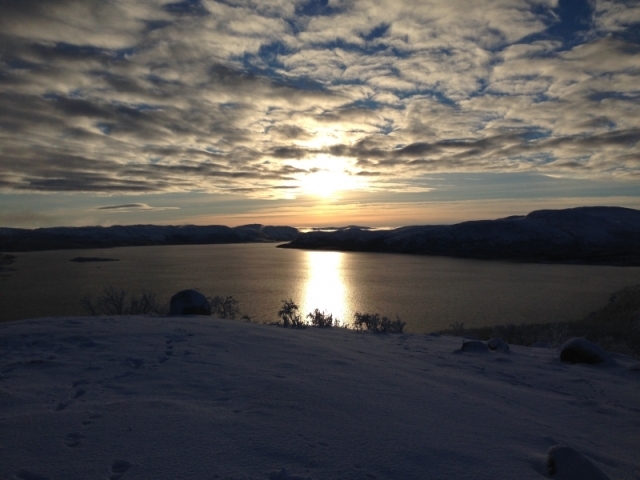 The distance from Kilpisjärvi to milestone is approx. 11 km. ... the longest stairs of Finland? Stairs are located in the hiking center Kilpisjärvi Saana take the route (approx. 4 km / direction) along the way. Count the steps and how many of them you can go without stopping. Fell Lapland Visitor Centre is perfect for those keen to learn about fell nature, nomadic Sámi culture, notable figures in Enontekiö's past and present, and the travellers of the North. In the Surroundings of the Visitor Centre you can find marked trails to Jyppyrä viewpoint (1,5 km) which offers a magnificent view of the fell area and Peuranpolku Nature Trail (2 km), describing the hunting of wild deer. Hetta Ski Resort is Enontekiö's home for winter sports; downhill and cross-country skiing, snowshoe trails, as well as a cafe. You can hire a range of equipment, including: snowshoes, sledges, snowboards and both downhill and cross-country skis. The lift takes you to the top of Jyppyrä where there is an open shelter with fireplace and has panoramic views. In Hetta Ski Resort disc golf can be practiced year-round. What would be more fun than searching "treasures" with the children. Enontekiö geocaches. Bird watching can be a fun thing to do for a child. Enontekiö has three towers for bird watching. Enontekiö is the best place in Finland to see the northern lights. In Hetta Huskies farm you can meet over 100 dogs and pups. The farm is open for walk-in visitors throughout the year. While the rest of Europe prepares for the summer, in Enontekiö you can make up the best ice fishing stories and compete in a series of competitions around the region. Kilpisjärvi Midsummer Skiing event is fun and unforgettable sports event at Saana fell which have been arranged since 1946 without interruption. Competitors have up to 250 metre track to ski along depending the amount of snow. How to get to Enontekiö? Enontekiö can be reached by car or by train to Kolari. In Lapland, the distances are long, so the car is essential. Enontekiö has also an airport, which operates during the high season. Outside the peak seasons Enontekiö can be reached by plane to Kittilä. Other airports are in Kiruna in Sweden and Tromsø in Norway. "We are Ansku and Marjo and we live in Kilpisjärvi, Finnish Lapland and we like outdoor activities. 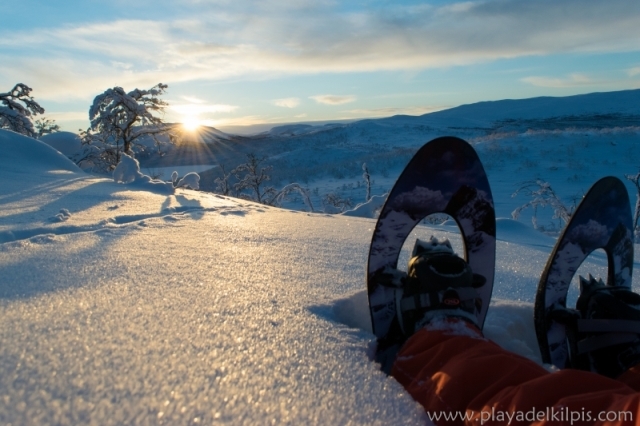 There are lots of great places here in Kilpisjärvi and also near in Norway. We wanted to share that information also to people visiting here and that was how Playa del Kilpis Tours was founded."